SRIMF - a grand musical event is hiding behind these ﬁve letters: for the ninth time, the ducal city was host to the "Sulzbach-Rosenberg International Music Festival." With the words "Many thanks and until next year," mentor Misha Quint bade farewell to an deeply enthused audience after a grand ﬁnale. No one is more annoyed than Andrzej Grabiec that acute heart problems forced him to cancel conducting the large orchestral concert of the Festival Academy this Saturday. Replacing his individual style and stirring artistic personality on such short notice meant a great challenge for the musicians. Steffen Weber, leader of the City Singing and Music School of Sulzbach-Rosenberg, stepped into the breach. The facility and engagement with which he and the orchestraʼs players, despite their plight, delivered a lively and spirited ﬁnale brought the audience to their feet for lengthy standing ovations. Whatever one might think of Bach interpretations, the ingenious music always shines through. And so it was interesting to hear the solemn baroque masterʼs "Suite Nr. 2 in B minor" with the lively Nicole Rabata as the ﬂute soloist. Her technically brilliant, sensitively polished "Badinerie" was extraordinarily pleasing. After the intermission, a string ensemble delivered the "Brandenburg Concerto No. 3" as a breathtaking par force hunt. There was no hint of dusty chamber music; it resounded, full of life and with clear spirit. Irena Portenko set the tone on the cembalo with freshness, liveliness and charm while the young, highly motivated musicians followed the exceedingly fast tempi with precision. Together they awoke this timeless music to completely new life. Misha Quint, mentor of the "Sulzbach-Rosenberg International Music Festival" (SRIMF), is made of these three components. This year, too, he explored all registers of feeling with Saint-Saens Cello Concerto Nr. 1; the ﬁnely dressed musicians supported him with equal effervescence. Not only the technical perfection and the spiritual penetration of his artistically impressive and technically balanced interpretation, but also its liveliness won over the audience. Quint played with grand virtuosic passion, with poetry and, one might even say, with a relaxed and youthful temperament. After a somewhat longer intermission, the large orchestra triumphantly brought out Joseph Haydnʼs "Symphony No. 45." The musicians produced beautiful music: light, buoyant and powerful. It was a decidedly fresh interpretation, but with the nickname "Farewell" Symphony. Toward the end, the musicians began to slowly leave the orchestra. The string section, the horn player, and the oboist packed up their instruments and disappeared. The lights went out and at the close, only two violinists remained to end the piece. A humorous hint to the Prince Esterhazy, who did not want to let his orchestra go on vacation. 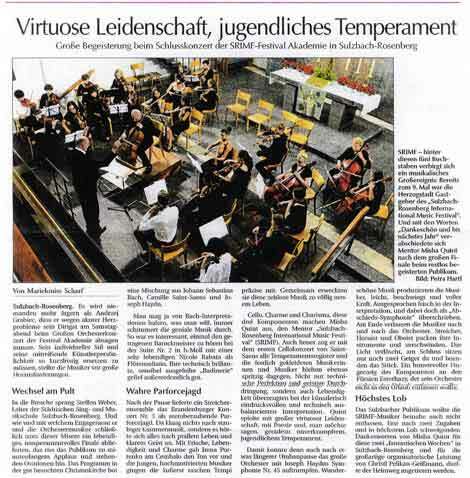 The audience in Sulzbach, too, seemed almost unwilling to let the SRIMF musicians go. 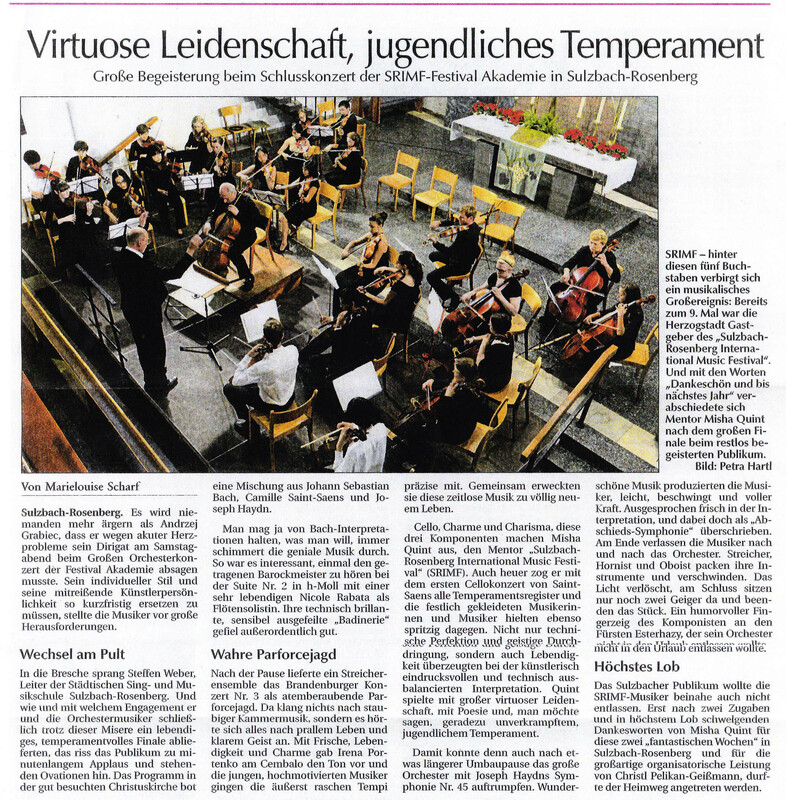 Only after two encores and the Misha Quintʼs praise-ﬁlled words of thanks for two "fantastic weeks" in Sulzbach-Rosenberg and the terriﬁc organizational efforts of Christl Pelikan-Geißmann were they allowed to start the long way home.